There is intellectual theology, producing writings, but there is also experiential theology, producing prayer. One such experiential theologian is Sister Marie Keyrouz of the Order of the Sisters of Basil, a Byzantine Catholic order. 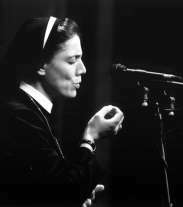 Born and raised in Lebanon and gifted with a beautiful voice, Sister Keyrouz lives the words of a saying of St Basil: “When you sing, you’re praying twice.” Her faith is magnificently apparent in her singing, especially in those instances employing the extemporization of certain traditional Arabic forms of music. Theological words become prayer soaring ever higher on wings of faith, and when they are given such an expressive voice for their medium, one might be truly enchanted, truly inspired. This is not the same safe harbor that Sister Keyrouz found, or that many of you reading this will have found. Sister Keyrouz was, however, a lighthouse on a headland along my tempestuous journey Home, and I thank her for her light.